NEW ORLEANS – There was a slew of upheaval in the NCAA Division II Women’s Cross Country National Coaches’ Poll. The same could not be said for the men’s rankings. 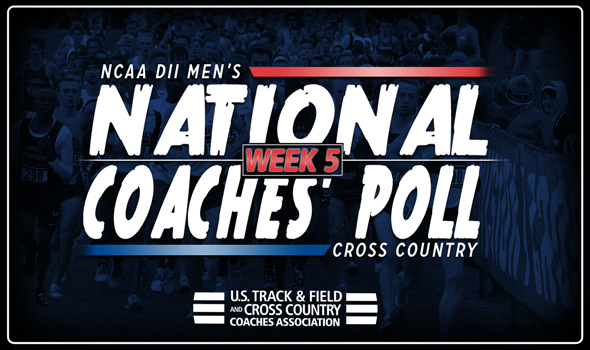 Besides some minor shuffling amongst the top-10 teams, this week’s poll that was announced by the U.S. Track & Field and Cross Country Coaches Association (USTFCCCA) on Wednesday is reminiscent of the poll from a week ago. Cal Poly Pomona and Cal Baptist were the only teams to make a significant push in the top-10, as both jumped two spots to fifth and seventh, respectively. The former of the two teams was idle this past weekend, while the Lancers finished second at the highly-competitive Lewis Crossover. McMarshall Hartzenburg paced the squad in Romeoville, Illinois, finishing third with a time of 24:57.1. The top-four teams in the polls remained in place, with Adams State picking up all eight first-place votes for its sixth-straight first-place ranking. The Grizzlies competed at the Fort Hays Open last weekend and were led by Chandler Reid (24:52.4 – second). An idle Colorado Mines stayed put in second place, while Grand Valley State and Chico State held onto third and fourth, respectively. GVSU won the Lewis Crossover thanks in large part to a runner-up finish by Wuoi Mach (24:48.3), while the Wildcats of Chico State won the 44th Annual Western Washington University Cross Country Classic on the backs of seven top-eight performances, including Connor Fisher’s (31:37.8) victory. Augustana (S.D.) (eighth) and Queens (N.C.) (10th) remained did not move in the rankings, while Mount Olive dropped one spot to sixth and Southern Indiana fell three spots to ninth to round out the top-10. Western Oregon set a new program-best ranking by coming in at a tie for 13th this week. Stonehill also made a significant jump in the rankings by moving up eight spots to 15th for its best ranking since coming in at 15th during the sixth week of the 2012 campaign. Three new teams made their season-debuts in the rankings this week in Lindenwood (11th), Western Washington (23rd) and Central Missouri (25th). Lindenwood’s rise to 11th can be attributed to defeating five nationally-ranked teams at the Lewis Crossover. Western Washington finished second behind Chico State at its home meet and Central Missouri was third at the Fort Hays Open. Additionally, Walsh and Academy of Art returned to the rankings this week after strong showings at the Lewis Crossover. Walsh fell out a week ago, but returns at 19th after placing seventh at the aforementioned meet. Academy of Art hasn’t seen its name in the rankings since the preseason poll, but comes in a 24th this week after finishing just two points behind Walsh, despite a first-place finish by senior Gatien Airiau (24:42.8).